Our dynamic ropes are designed to absorb high amounts of energy. This energy absorption reduces the impact forces acting on a climber during a fall from a height. Generally, when it comes to dynamic ropes we distinguish between single ropes, half ropes, and twin ropes. A single rope is a dynamic mountaineering rope. When used as a link in the belaying chain, it is able to arrest the fall of the lead climber. In industrial climbing, usually only single ropes (of diameters from 10 to 11 mm) are employed. Especially in rope access, single ropes are very often used as cow tails. Half and twin ropes are used in sport climbing. For information about our entire product range for this segment, please visit our Maxim® website. 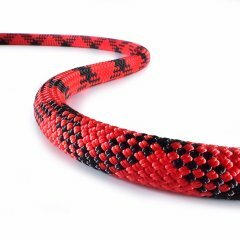 Each of our climbing ropes boasts superior abrasion resistance and longevity. Furthermore, they are certified to EN 892 and UIAA 101. Our product portfolio for dynamic climbing ropes for safety and rescue use includes three special-purpose rope models: Apex, Glider, and Foris. 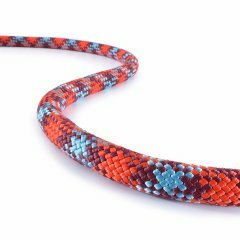 Dynaflex is a dynamic rope with grippy cover and high abrasion resistance for the use under extreme conditions.